There is a tradition on Sundays at our house, it started one day when I was looking for inspiration in my vast collection of cookbooks. I came across two that I have overlooked for quite some time. One is called “The Black Family Reunion Cookbook” and the other, “Healthy Soul Food”. I started making a few dishes inspired by the books every Sunday and now the recipes have been incorporated into my collection. I am going to share with you a new soul food staple each week most likely on Mondays… today it’s my southern Grandmother’s biscuit recipe. *it took me MANY attempts to get this PERFECT pat attention to my notes! Combine all the DRY ingredients into a bowl, cut the shortening into the flour with two knives or a pastry blender.Add the milk and stir JUST UNTIL the mixture forms a ball. Place in fridge 20min. Preheat oven 425. Turn the dough onto a floured surface and knead it ONLY 14 times. Pat out 1″ thick. ( thick is the key here)Cut with a 2″ biscuit cutter. 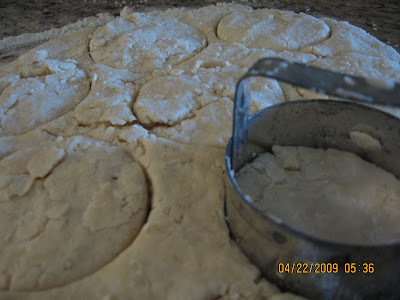 Place on cookie sheet (I put parchment on mine) 1″ apart. Bake 15-20 min. Keep an eye on em though…sometimes mine bake quick. ENJOY!